It’s a couple of months since I posted about my depression and I’ve since been to see my doctor and started on anti-depressants. I’m a different person to the one I was a few months ago; I’m cooking, looking after my house and my kids, starting the first module of an Open University degree and even taking small steps to get back into writing and revising the novel draft I finished earlier this year. I hadn’t realised until looking back over the past few months, years, whatever, how much of my life was lost to depression. Now that I’m getting my life back I think how lucky I am and how important it is that anyone who is worrying about depression gets some help. Anti-depressant medication won’t help everyone, or it might but only after much experimentation to see what suits you personally, but it has to be worth a shot. Anyway, there are some small things I’ve found that help lift me, even with the drugs, when I feel that dark tug. Music. Make a playlist and put on your ipod, burn it to a CD, whatever. Make a couple, actually; one should be a wallowing CD, where you feel free to just feel miserable. IMHO this should be saved for certain occasions like where those blasted hormones add their tuppence’orth to the slurry pit of life. The main one should be any and all music that gets you singing along or dancing in the kitchen or nodding like the Churchill dog, whatever eclectic mix it ends up as. One of my mood CDs has some Breton folk music, the 1812 Overture and Christina Aguilera’s Beautiful all on the same CD and I love it. FYI, Queen are generally a good bet. Can anyone resist doing a Wayne’s World to Bohemian Rhapsody? Find a ‘hand hobby’. Mine is baking (Marian Keyes’ book is an excellent place to start), yours could be gardening, knitting, woodcarving. Something traditional and satisfying, that really uses your hands. For all though there’s something soothing about using your hands and sort of getting back to basics, I’ve heard too that actually stimulating the nerves in your hands produces happy hormones. Sounds good to me? Also, it’s very stress-relieving to knead the bejeebus out of bread dough or chop carrots with venom. Better the carrots than the husband, if you ask me. Light a candle. Yes, even in summer. The dancing light of the flame is hypnotising and soothing, and the scent should be one that makes you happy. Spend time, AGES in fact, browsing a good selection of scented candles to find one you like and remember that smell is quite a personal thing, with a scent that one person loves doing absolutely nothing for someone else. I have a Yankee Candles Black Cherry one that I love. It’s a very happy scent, fruity and sweet and ever so slightly decadent-dressed-up-as-wholesome. Get into nature. Gardening, as I said above, is fabulous although I’m no-one to talk since I’m generally acknowledged among the family as the Kiss of Death to plants. But I hear it’s very good for you and the time I do spend in the garden I feel peaceful and satisfied. Sally Brampton in her book Shoot the Damn Dog is a wonderful advocate of gardening. Plus you’ll be saving the planet and that’s a great thing for giving a teeny boost to your sense of self-worth. There’s also going for a wander in some greenery, going to the beach and running sand and/or water through your fingers or going to the top of a windy, exposed hill like in the Dales and letting the elements hit you. Even better if it’s raining, but try to have someone standing by in the car with a flask of tea and a towel and a hug. I love the feel of rain on me, it really reminds me I’m alive which is far too easy a thing to forget. Explore alternative remedies. I’m a great believer in aromatherapy and western herbalism, and I hear loads about the power of meditation and mindfulness. Close your eyes in the middle of a depressive spell and spend five minutes breathing deeply and listening. If there’s running water nearby that’s a bonus but it would be good if you weren’t distracted by needing a wee in the middle of connecting with your inner self. These help me, but won’t all work for everyone. The important thing is to find what does work for you in my opinion. Some people find writing during depression extremely therapeutic; I couldn’t face a pen and am having to ease myself back in. And all of these are self-help tricks, not cures. No substitute for going to a trusted doctor and talking through how you feel. Most importantly, acknowledging to first yourself, then your closest family, that there’s a problem is absolutely essential and can take ages. I’ve had a problem for years but didn’t acknowledge it till last year, and even then it took months to come to terms with properly and even longer to ask for help in the form of medication. The important thing is to give yourself permission to feel how you do then you can start to look after yourself. Now I’m off to pummel some bread dough. I remember hearing about Marian Keyes having a bad time but beyond feeling sympathy for her, I didn’t think too much of it at the time. Then over the last couple of years my own problems kind of took over everything. When I saw a copy of Saved by Cake on the shelf in Waterstones, it drew me in first by the gorgeous cover with its retro colours and style. Then I noticed the author and remembered her having troubles, which led me to pulling the book down and reading the intro, and flicking through the recipes. I then spent the next two weeks either drooling over the pictures I had seen or feeling drawn to Marian’s brutally honest description of her depression and her warm and witty way of writing until I got the book for myself yesterday. I spent all evening reading every single recipe (when I was allowed to; Emily shows every sign of inheriting my penchant for cakes and insisted on looking at every picture herself. Two or three times…) and trying to restrain myself from rushing straight out to Sainsburys and buying a list of ingredients and cookie cutters (do read her take on cookie cutters. I love it!) a mile long. I decided to limit myself to trying a recipe a week (well, maybe two…) and this morning bought the ingredients for the first one to do some time this week, probably at the weekend. Then this afternoon I went to a parent and toddler group. Now, I’ve mentioned my social anxieties before. They make these groups a particular kind of torture, and I’m serious, I think I get through the entire group without more than 5 words spoken to anyone except Emily. I spend all the time I’m not talking feeling miserable and anxious about not talking and it all goes horribly wrong. Emily goes home bouncing because she’s had time with new toys and I go home ready to burst into tears, every bad feeling about myself confirmed again and again. So this afternoon when I came home, I thought ‘Why not, let’s give Saved by Cake a go,’ and did the Blondie cupcakes (white chocolate and macadamia nut…). Now, there’s a funny thing about baking as therapy. I do have a tendency to comfort eat, but that’s the weird thing. I found baking these cupcakes (and most of the cooking I’ve done over the last few weeks) unbelievably calming. I feel much better and I’ve only had half of a cupcake (just to test, y’know). It’s not the end result that’s the point of doing this, as nice as it is; it’s completely about the process. It’s not like I’ve just discovered baking through Marian Keyes, I’ve been increasingly keen on cooking and baking over the last couple of years and it’s picked up madly since we moved house and I got a really nice oven (my last oven was no good for baking as the flame went under the floor of the oven and burned the bottom of stuff before the top was cooked. I daresay a good cook could have managed with it; I’m not that cook). I’ve done a few nice cakes lately, mostly plain sponges with cream and strawberries, and a couple of packet mixes – highly recommended for a quick and cheap cake fix eg for Sunday tea as they’re very light and tasty and did I mention cheap? But Marian Keyes’ book has opened up a whole new world of flavours and possibilities, both classic and traditional as well as more exotic like Chocolate, Cardamom and chilli tart, and it’s totally about the process, like I said earlier. If you want a cake for the sake of eating it, buy a packet mix or even a ready made one. If you want to bake and be Saved by Cake, buy this book and start exploring. 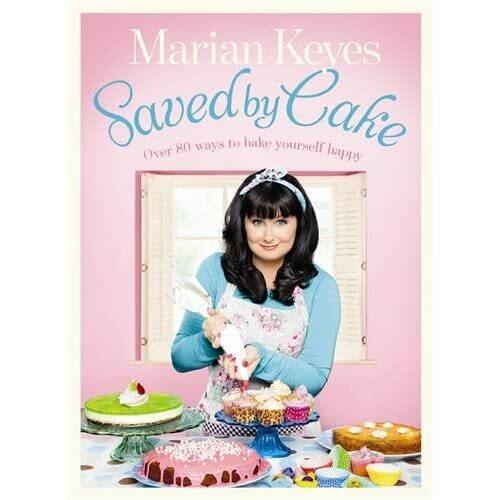 And incidentally, her simply wonderful voice shines through and has made me into the latest Marian Keyes fiction fan. Now I’m off to snuggle down with a Blondie cupcake and a novel. Hello! Did you miss me? I know I missed blogging, writing, tweeting and facebook-ing over the past couple of weeks. One of those times where life just completely takes over. Underneath the chaos caused by decorating, cleaning, and de-cluttering I could sense the laptop sitting there all alone and unloved, calling me. But I’m back (hugging laptop then realising that actually that’s quite weird). One of the side effects of having some time away from writing is I’m all fired up again now, champing at the bit to get going again, which feels great. Even better is the feeling that I want to get back to my novel – at this stage in previous novels I’ve given up by now and moved on. It’s really satisfying, knowing that this time I want to see this through, and that I really think I can. I also have ideas firing off for both short stories and the next novel, and I’m getting a second lease of life for my picture books so I’m raring to go! My blog challenge is also still standing (see here if you don’t know what I’m talking about), and another post, on The Passion of Football, will be coming soon. Finally, in the whirlwind guide to my writing so-called life, I’ve recently been introduced to 6 Minute Story by @rebeccaemin. Basically, you sign up (using your Twitter name if you like, so if you check it out look out for me – rebeccaebrown) and on being given a prompt you start writing, with a timer counting you down for six minutes. Yes, it’s that complicated. Very challenging though, and I recommend anyone give it a go! My very first attempt is here – be kind! 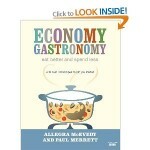 listing) is a fabulous cookery book giving easy to cook meals that look fabulous but are really economical to do. Hence the title. And my favourite recipe, which I’ve made about 4 times in the last week or so, is Chocolate Brownie Biscuits. Except I prefer to call them Brownie Bites because, well, it just suits them better. Anyway, try ’em and see. You won’t regret it. And why have I, of all people, taken up cooking? When the phrase ‘Can’t cook, won’t cook’ pretty much summed me up? Well, I guess I’ve grown up a bit. I used to resent cooking. I didn’t have any particular talent or enjoyment from it, and no interest really in learning. Recently though, having two children has matured me in more ways than one. I’ve felt responsible for providing a good home for my family, and that includes food. I let my son down a lot when he was weaning by almost completely relying on jars and pre-prepared baby foods. Now he is an incredibly fussy eater with virtually no inclination to try anything new, and regularly going off the things he did like. I know toddlers go through these phases, and I can’t be sure 100% that it’s because of how I approached his first foods, but I know I didn’t give diet and nutrition the importance it should have had. 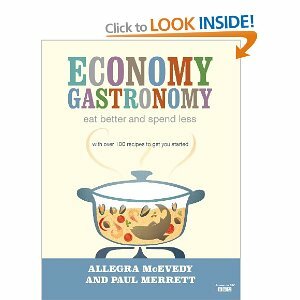 Now I’ve reconciled myself to the idea that cooking is just one of the things I need to do so I’d better get on with it, I’ve invested in a few kitchen tools and got some help off my mum and this book to do some decent food. And you know what? I’m loving it. I’m enjoying cooking, I’m enjoying providing good meals and seeing my husband’s face when he tastes what I make him. I’m loving baking biscuits instead of buying them. I’m usually a fad person – I’ve had loads of interests that have burned fiercely then died away to nothing, so there’s a chance this will too. Except that it’s too important to let drop completely. Emily started eating solids today, and before I know it she will be eating proper food, and I owe it to her and to myself to do the best I can to provide her with decent stuff. So, I’m off for a cup of tea, and a fresh-baked Brownie Bite. Any takers?